Here at One Community’s Eastleigh Young Carers Project, every day is Young Carers awareness day. Each single day here we champion our young carers, advocate on their behalf, provide them with emotional support and life skills opportunities, and try our best to give them as much well deserved respite as possible. Young Carers Awareness Day is an initiative lead by The Carers Trust, and each year the day follows a theme. This year they decided upon the theme ‘When I Grow Up’ to highlight the struggle young carers face when transitioning from being a young carer to being an adult carer. Due to their caring role, many young carers forgo opportunities often taken for granted by other young people such as choosing a college, university, or career. Young carers more often than not at this critical juncture of their life still bravely and selflessly put the needs of their cared for first, meaning they may decide to drop out of education all together, or just pick the closest establishment or placement to enable them to still live at home. For many of these young people, there isn’t even the question of anything else. This is their norm. The concept of ‘When I Grow Up’ therefore is slightly different for young carers. They have a whole host of responsibilities to think about, and this means their priorities are different to those of other young people. That is why the support of organisations such as Hampshire Young Adult Carers is so important, as they tailor their support to the age group facing this quandary. Moving out, going to college or university, or getting your first job is a daunting prospect for all young people, but add a caring role to that and the pressure dramatically increases, and a certain amount of ‘hand-holding’ is needed. One could argue that the whole ‘what do you want to do when you grow up’ question is a bit of a pressure cooker in itself. Many adults from their twenties to their fifties still have no idea what they want to do when they ‘grow up’. A lot of people don’t feel like they ever do ‘grow up’, and in fact you just move forward at your own pace, gradually picking up more responsibilities (bills, house, relationships, kids, pensions, insurance, car etc.) as you go. It is a lot of pressure to put on a child to expect them to have it all mapped out from an early age. It is also unnecessary as nowadays you can re-enter education to change path at any point. There are numerous ways of advancing yourself at any age which aren’t thought of as traditional routes such as traineeships, apprenticeships, internships, evening classes, online classes, or the good old traditional ‘working your way up the ladder’. It is the one size fits all model that is damaging to our young people, and particularly young carers who require an even greater degree of flexibility. If you think about it, what do you want to be when you grow up? The only truthful answer I can come up with when pondering that question is simply ‘happy’. Of course, happiness is made up of a number of components – home, work, relationships, hobbies, mental wellbeing, financial stability etc. But that doesn’t necessarily mean having the best paid job, lots of qualifications, and a life plan all laid out. It means doing the best we can at every turn, being kind to ourselves, to others, and to the world around us. 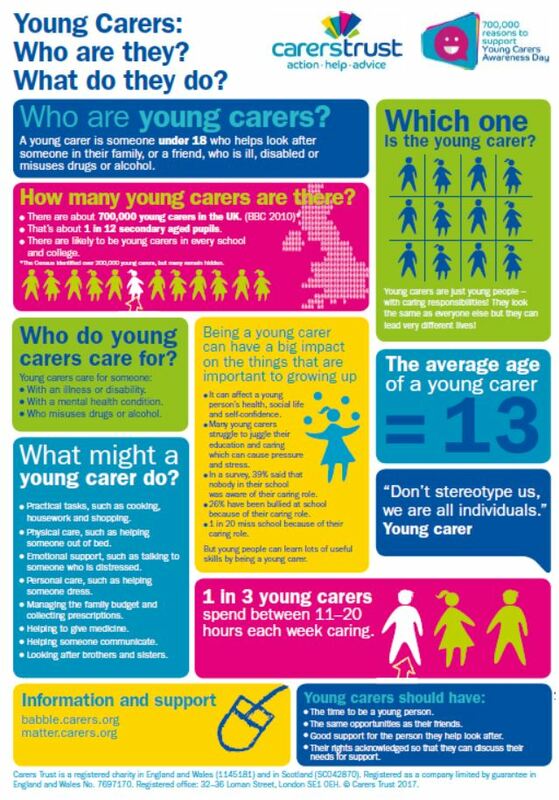 That ethos of an individualised path is the one we champion here at Eastleigh Young Carers and wish to share with the world this Young Carers Awareness Day.